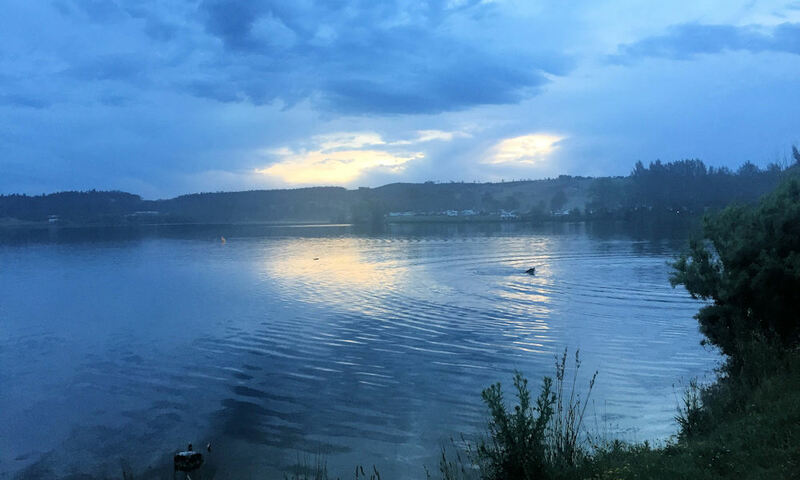 Lithgow City Council has started preparation of a Plan of Management for the Lake Wallace Recreation Area in Wallerawang. The Plan will guide the use, development and management of the area into the future. Council is inviting users, the community and stakeholders to offer their views about the location’s future -what they value about Lake Wallace Recreation Area; how they use the area; areas they feel need attention; and suggestions, ideas or future directions for this popular area – to help prepare the Plan of Management. Lake Wallace Recreation Area is located a short distance south-east of the Wallerawang town centre, to the east of Barton Avenue, about 15km north-west of Lithgow. The area managed by Council covers approximately 44 hectares on the western and north-western shores of the dam (Lake Wallace). Lake Wallace Recreation Area features extensive open grass areas adjoinging the dam and on the nearby flats or hillslopes, broken up by groups of trees and areas undergoing revegetation. The dam’s shoreline is a mix of open grassed banks and other areas fringed with wide reed beds and ocassional trees. The recreation area offers a well-maintained attractive open space, with scenic veiws, and a range of leisure and recreation activities and facilities. The series of bays and points along the foreshore help break the recreation area up into several activity “spaces” – from more popular or busy areas, to quieter out-of-the-way corners. • a shared (sealed) path along the Park’s western edge. 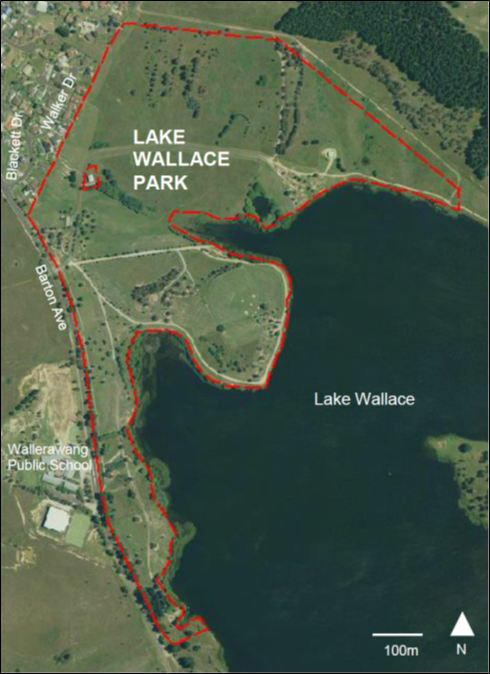 Lake Wallace Recreation Area is a valuable and well-used open location within the Wallerawang area. It is a popular place for local leisure and recreation activities and sports – from quiet relaxation and children’s play; through to dog-walking and exercise/fitness training; to competitive baseball. The dam is regularly enjoyed for sailing (no power boats), kayaking, fishing (the lake offers excellent trout fishing all year round), dragon boating and sailability activities. Recently Lake Wallace Recreation Area has become an increasingly popular destination for RVs and caravan stays (but with some limitations necessary on these uses). The Park is also used for social gatherings and community events, including New Year’s Eve Fireworks in recent years. The dam and surrounds is also a haven for wildlife. It is important that lake’s recreation area’s users, neighbours, stakeholders and the wider community have a role in preparing the Plan of Management. This is to ensure the area’s use and management is consistent with the community’s expressed thoughts and ideas. Management of Lake Wallace Recreation Area must also align with the relevant objectives of other Council plans notably the Our Place Our Future – Community Strategic Plan 2030 and acknowledge that Council has an agreement with Energy Australia regarding the lake’s recreation area and its management. A summary of the process Council will follow in preparing the Lake Wallace Recreation Area Plan of Management is outlined at right. It includes opportunities for interested people and groups to be involved or contribute to the Plan’s preparation. Such involvement and inputs are important to ensure the Plan, and ultimately the area’s management, responds to community opinions, ideas and desires for the area and its future. Council has engaged Gondwana Consulting to assist in preparing the Plan of Management. There are a number of ways you can contribute to preparing the Lake Wallace Recreation Area Plan of Management. Attend one of the planned community engagement events (such as; an on-site information kiosk, or special-interest focus groups). Providing your opinions, ideas or suggestions directly to either of the project officers listed below. Your views will contribute to preparation of the Lake Wallace Recreation Area Draft Plan of Management, which will also be subsequently exhibited for further community review and feedback. Andrew Powrie, Senior Economic Development and Destination Manager, at Lithgow City Council – on 6354 9988 or e-mail andrew.Powrie@lithgow.nsw.gov.au (or by post at Lithgow City Council, P.O. Box 19, Lithgow, NSW, 2790).